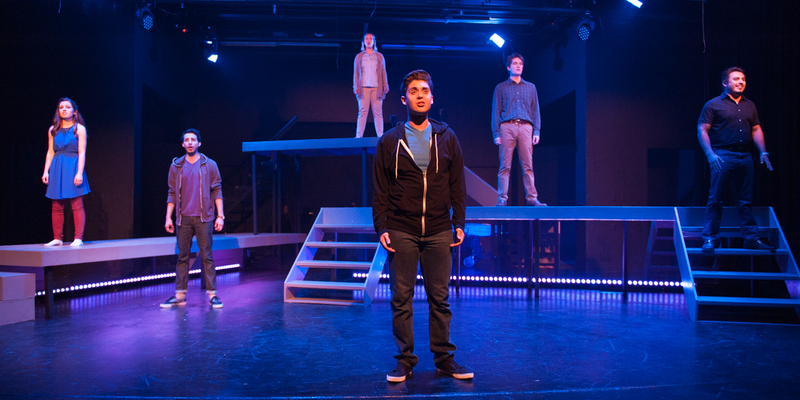 Love Is Insane: The Gem’s “Next To Normal” Has The Prescription For Mind-Blowing Theater In Garden Grove, CA. 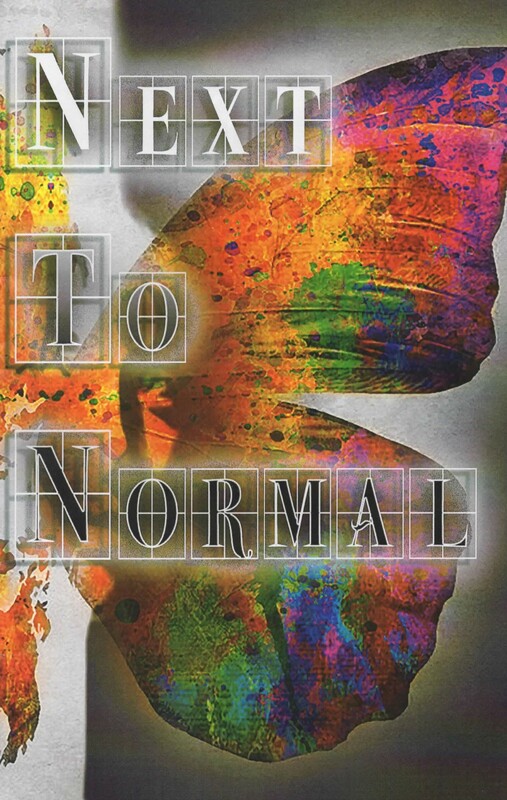 “It’s medicine—not magic” her doctor informs “Diana”, the complex woman at the center of “Next To Normal”–the winner of three 2009 “Tony Awards” including “Best Musical Score” as well as the 2010 Pulitzer Prize. “It’s not perfect, but it’s all that we’ve got.” The latest undertaking at the historic “Gem Theatre” in Garden Grove California, the show is in keeping with the theater’s resident production company, “One More Productions’” ethos of more than simply offering local audiences the kinds of stage entertainment that they want to see, bestowing upon them the type of unique (and in this case poignant and profound) theatrical experiences they deserve as well. “This is a story that deserves to be seen” said Director Damien Lorton on opening night; “It’s a story that deserves to be told!” In point of fact, the six-character piece is an exceptionally good fit for the intimacy of “The Gem’s” 158-seat auditorium; don’t be fooled though–there’s a whole lot of humanity and some gargantuan emotions exploding across that stage thanks to a soul-stirring production that addresses such issues as grieving a loss, ethics in modern psychiatry, and so-called “normal” suburban life. 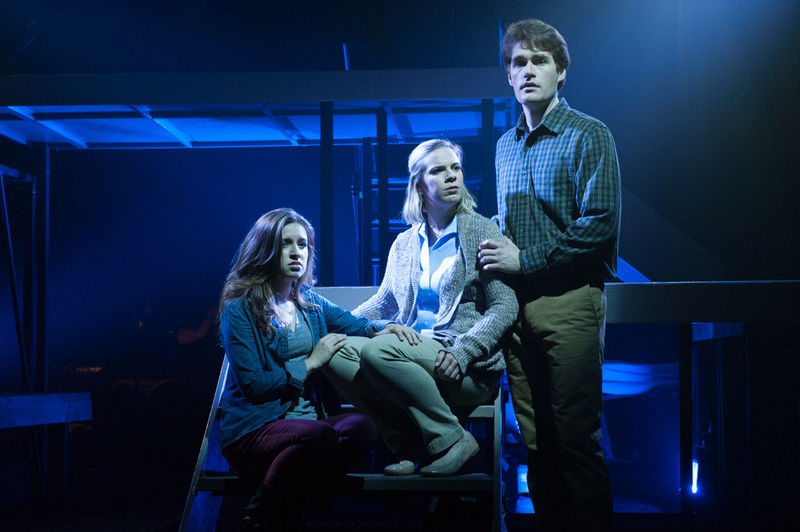 “Next To Normal” introduces “The Goodman Family”–an almost stereotypical middle-class American family. Dan the father is an architect, mom Diana stays home and cares for their teenage daughter and son; all ‘appears’ to be ordinary to the point of mundane. Look a little closer though and you’ll see their lives are anything but typical, because Diana has been battling serious manic depression for 16 years. 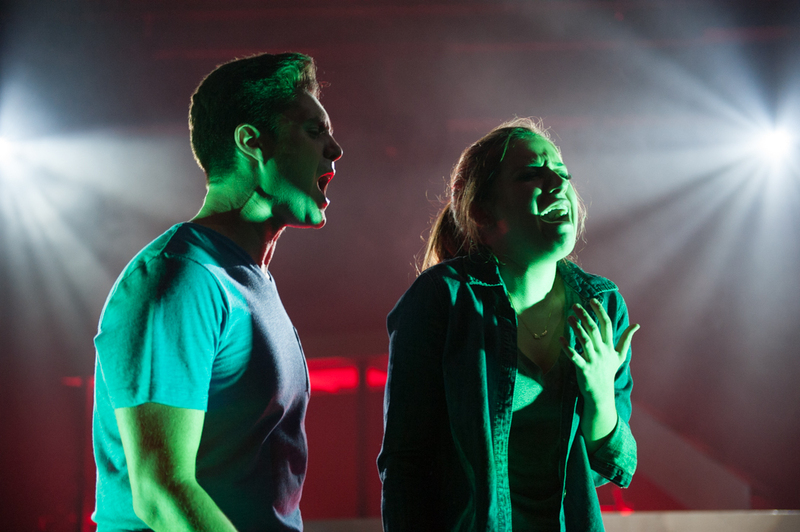 Featuring a vivacious pop/rock score by Tom Kitt who wrote the music and Brian Yorkey who penned the book and lyrics, the result is an incredible and intensely moving bit of theater if ever there was one–highly enjoyable even as it tugs at your heartstrings. “One More Productions” Co-founder Damien Lorton, who serves as both the Stage and Musical Director, wisely favors subtlety and realism over overt ‘flash’ and ostentation for ostentation’s sake, which makes the substantial issues the show introduces shine solidly through! 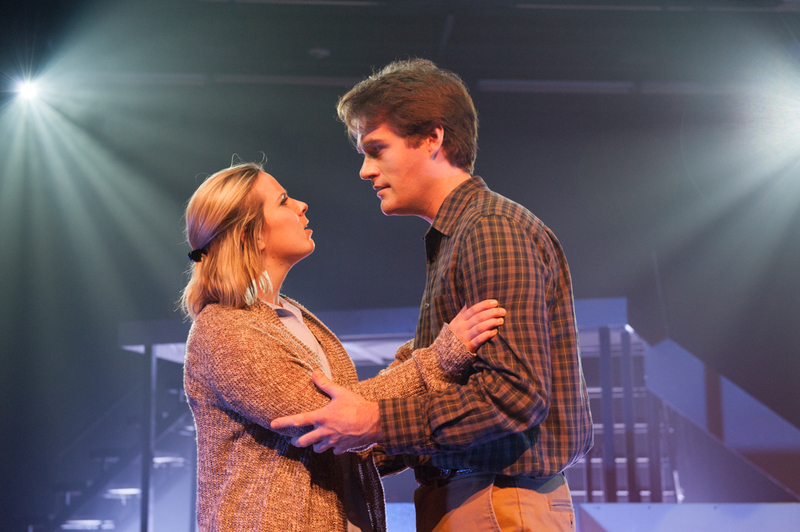 Likewise, Wally Huntoon’s bare-bones, split-level utilitarian set, complimented by John Hyrkas’ vibrant, multi-colored digital lighting design, wonderfully puts the actors–and everything they’re enacting–in sharp focus. The top-notch cast expertly work together to create numerous “can’t miss” moments on stage—many one right after the other. “My Psycho-Pharmacologist And I” is a rousing group endeavor early on, and speaks with knowing authenticity to anyone who’s ever had to deal with any kind of psychotropic, or mood-altering medications. Throughout, there are plenty of duets and trios that propel the plot forward, taking viewers intimately into the hearts and minds of each character with equal doses of sincerity compassion and sometimes jolting relatability. Given that Diana doesn’t respond well to her ‘drug therapy” more extreme measures are called for—including rounds of “Electroconvulsive Therapy” (ECT) This inspires two more ensemble accomplishments –“I Wish I Were Here” (which opens the second act,) and “Better Than Before”, during which Diana’s family and doctor try to help her rebuild her impinged memory brought about by such radical neurological treatments. Unfortunately, if the temporary memory loss it causes weren’t bad enough, memory recovery provokes relapse. “What happens when the burn has healed, when the skin has not regrown? 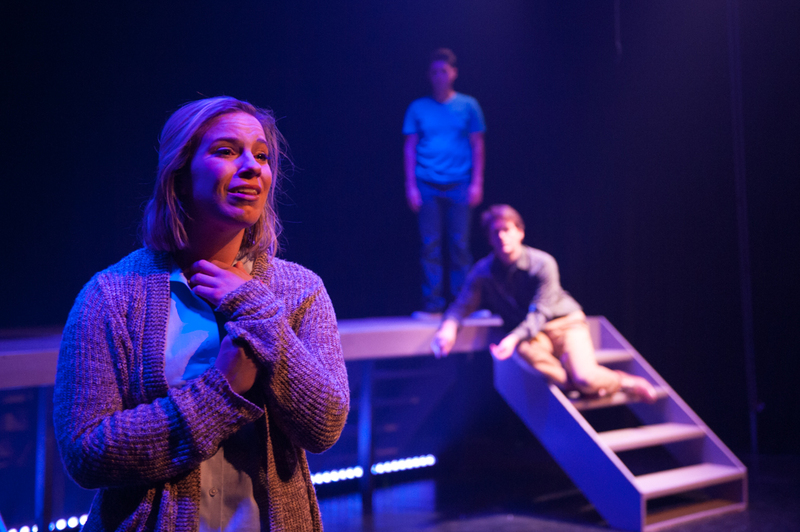 As housewife, mother and “Pfizer Woman Of The Year” (–she jokes,) Elyssa Alexander triumphs in her excruciatingly “human” portrayal of “Diana” whose very personal journey we are taken on, and through whose eyes the events unfold. Possessing an expressive voice that handily manages all the intricacies of the sophisticated contemporary score, perhaps most importantly, Ms. Alexander displays terrific personability in a decidedly intricate, multifaceted role. This has us empathizing with her and her ‘condition” every step of the way. Diana’s first act soliloquy “I Miss The Mountains” in which she laments the flattened-out, homogenized nature of her feelings since beginning “meds” (even as she—secretly– contemplates going off them,) is brilliant and affecting: “Everything is balanced here and on an even keel; everything is perfect–nothing’s ‘real’!” she pines. Shortly after, her duet with son Gabe titled “I Dreamed A Dance” appropriately just might bring tears to your eyes, while “Maybe (Next To Normal)” is a tenderly conveyed “Eleven O’clock” number serving as a kind of optimistic ‘exclamation point’ to this venerable musical drama, as at last she tries to acknowledge and ease her daughter’s pain (“We’ll live with what’s real and let go of what’s past…and maybe I’ll see you at last” she consoles the girl.) Alex Bodrero also does an outstanding job as “Dan”–Diana’s ever-patient husband “who stayed” through all their combined tribulations brought about by her illness. His is another Key role that must garner our sense of connection in order to make the entire piece work, and in this regard Bodrero unfalteringly attains his goal! His solo “You Don’t Know” provides a genuinely potent moment, as does his first act declaration “I’ve Been”, wherein he overwhelmingly ponders the constant ups-and-downs of his life with Diana. Later, he delves still deeper in a forlorn, last-ditch grasp at hope with the couple’s Act One closer, “A Light In The Dark”. Kat Ljubic is also spot-on as their tightly-wound daughter, “Natalie”. (“You’re kind of a confusing person” her boyfriend tells her at one point; “you should see my mother,” she counters.) Ljubic’s performance here is refreshingly honest (as are all of those given by this cast.) Yet, although she gets most of the ‘laugh’ lines, this gifted young actress makes clear that her precocious sarcasm is merely a flimsy cover for a heavy existential hurt that’s too often been underplayed in previous versions. Her solo turn, “Super Boy And The Invisible Girl” is compelling and well-delivered, granting insight into this girl’s sense of isolation. (“Son of steel, daughter of air—he’s a Hero, a Lover, a Prince…she’s not even there!” Natalie broods.) In addition, Ljubic’s trio with her “Parents’, “A Song Of Forgetting” is not only beautifully sung by all three, it’s also one of those truly rare high-octane theatrical occurrences to be encountered on this or any stage! As her hapless boyfriend “Henry”, Jonathan Fierros also surprises and amazes. 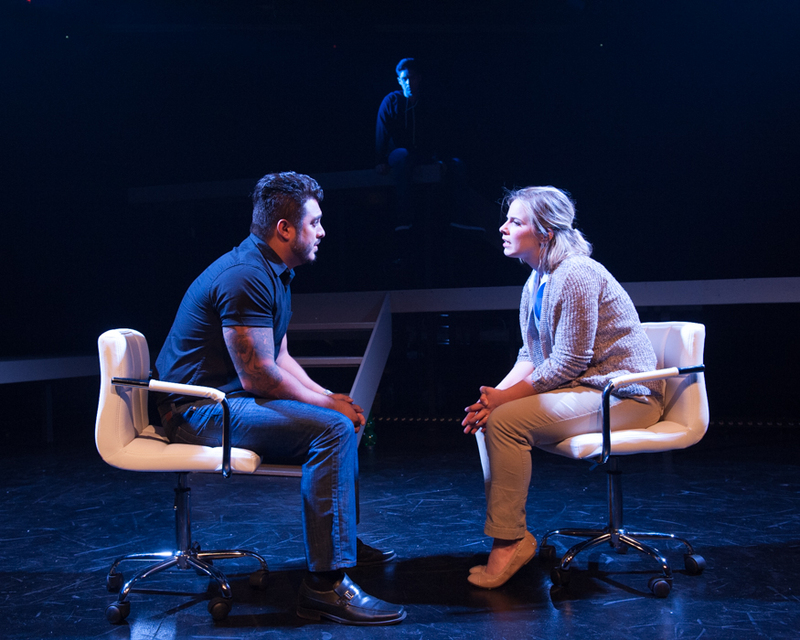 While most of Fierros’ best moments come after intermission, he gives the kind of quietly powerful performance that continues to impress long after the final curtain has been rung down. 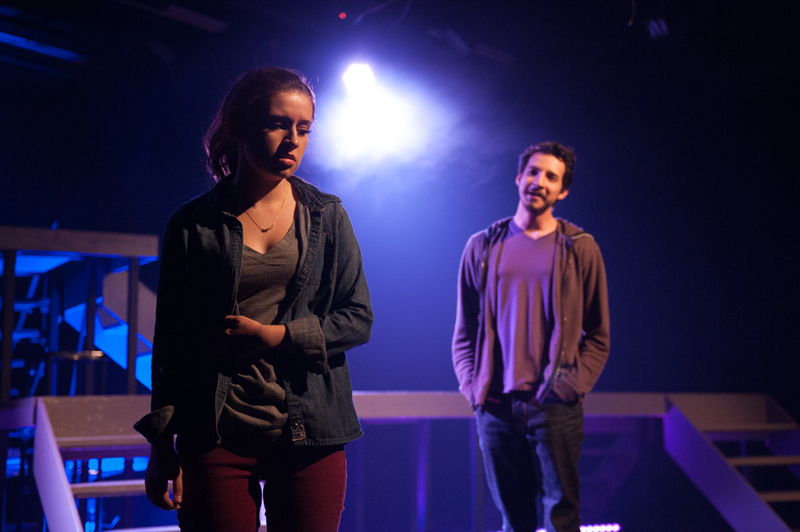 At first glance, his “Henry” may appear to be just another goofy stoner, but over the course of the show, he laudably transforms into someone far greater—affording Natalie her first real taste of understanding she’s ever known. Indeed, in furnishing her with some much-needed strength, she is later able to give it to her father when he too, needs it. Production Stills By Lisa Scarsi, Courtesy Of Dan Pittman at “Pittman PR” (www.pittmanpr.com) And “One More Productions” (www.onemoreproductions.com) Special Thanks To Dan Pittman, Lisa Scarsi, Damien Lorton, Nicole Cassesso, And To The Cast & Crew Of “One More Productions” “Next To Normal” For Making This Story Possible. This entry was posted in Theater reviews and tagged "Aftershocks", "I Miss The Mountains", "Maybe (Next To Normal)", "Next To Normal", "Song Of Forgetting", 2009 Best Musical Score Winner, 2009 Tony Award Winners, 2015 Southern California Theater Season, Brian Yorkey, Garden Grove CA., Mental Health Musicals, One More Productions, Pulitzer Prize Winning Musicals, The Gem Theatre, The Gem Theatre's "Next To Normal", Tom Kitt. Bookmark the permalink.